The Disability Voting Action Project (DVAP), Texas Association of Centers for Independent Living (TACIL), and the Coalition of Texans with Disabilities (CTD) are working together on a non-partisan statewide REV UP Campaign to Register people with disabilities and their supporters, Educate them on the positions of the candidates, and encourage them to Vote on December 16. View the REV UP flyer! 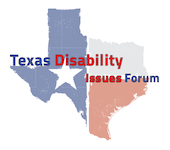 DVAP, ADAPT, The Arc of Texas, Texas Parent to Parent, and CTD coordinated with a wide range of groups and individuals to host the Texas Disabilities Issues Forum (TxDIF) in Austin. The Forum was a historic opportunity for voters who have interests and concerns about issues affecting Texans with disabilities to learn about the positions and potential policies of candidates from the Republican and Democrat parties, running for the top three statewide offices (Governor, Lieutenant Governor, and Attorney General). Candidates’ Surveys and Next Steps are still available at the Forum website.